This entry was posted in Chen Voon Fee Resource Center and tagged Architecture, book, heritage, kebaya, Library, vintage. Join Badan Warisan Malaysia for our RAYA OPEN HOUSE on SUNDAY, 16 AUGUST 2015. Bring a friend and explore more about the exciting programmes we have lined up for this year. There will be food and music; you can visit the Rumah Penghulu, network with other members and renew your membership! 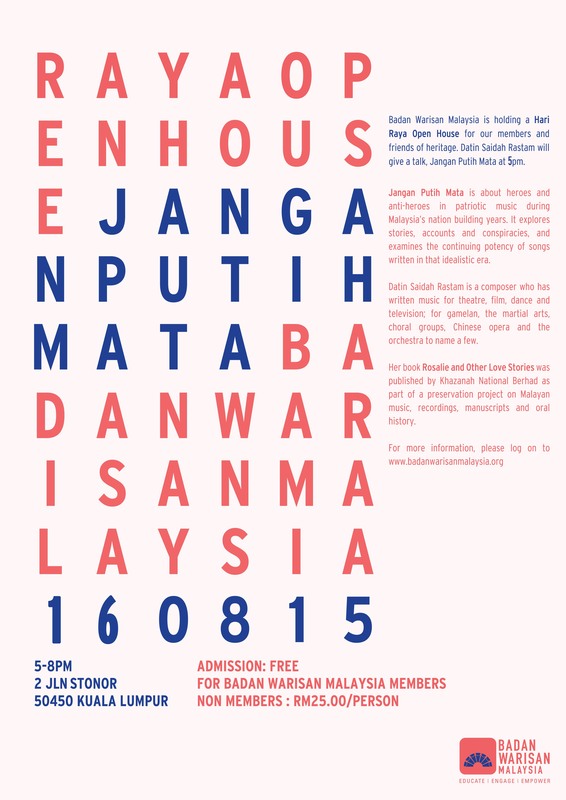 The evening will begin with a talk at 5.00 pm by DATIN SAIDAH RASTAM on JANGAN PUTIH MATA which is about HEROES and ANTI-HEROES in patriotic music during MALAYSIA’S nation building years. It explores stories, accounts and conspiracies and examines the continuing potency of songs written in that idealistic era. Datin Saidah Rastam is a well-known composer for theatre, film dance and TV and most recently, she composed and directed Malam Terang Bulan which was staged last September. She is the author of Rosalie and Other Love Songs, a preservation project on Malayan music, recordings, manuscripts and oral history. Saidah Rastam is a composer who has written music for theatre, film dance and TV, for gamelan, martial artists, choral groups, Chinese opera singers, orchestras and electronica. She was the musical director for the launch of the Petronas Twin Towers. A show she created last year, Malam Terang Bulan, for singers and orchestra and featuring Dato’ Zahim Albakri and Chacko Vadaketh, will be restaged at the Dewan Filharmonik Petronas in November 2015. Her book Rosalie and Other Love Songs was published by Khazanah Nasional Berhad as part of a preservation project on Malayan music, recordings, manuscripts and oral history. She is now working on a documentary on the early years of Sultan Idris Training College and the Malay College Kuala Kangsar: institutions which produced young men with radically different ideals. Saidah trained as a barrister and was in practice for seven years. This entry was posted in News & Events, Talks & Lectures and tagged 2 Jalan Stonor, badan-warisan-malaysia, book, events, presentation, walks & talks.